PHILIP H. ANSELMO & THE ILLEGALS Debut New Video For "Choosing Mental Illness"
PHILIP H. ANSELMO & THE ILLEGALS are pleased to unveil the official new video for "Choosing Mental Illness" from their Choosing Mental Illness As A Virtue full-length released earlier this year via Anselmo's own Housecore Records. Directed by Katherine Richardson-Anselmo with director of photography Mike Holderbeast and starring Michael St. Michaels (The Greasy Strangler), the six-plus-minute clip pays tribute to Milos Forman's 1975 drama, One Flew Over The Cuckoo's Nest. 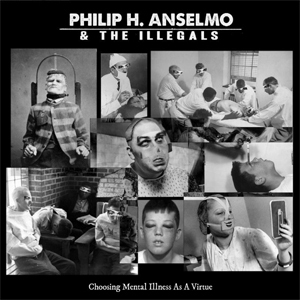 Issues Anselmo, "This video is based on one of my favorite films about the harshness of mental illness. Being up close and personal with the struggle, I often feel like R. P. McMurphy, who I play in the clip. I've had a lot of questions about the LP title, Choosing Mental Illness As A Virtue and song title, "Choosing Mental Illness"," he continues, "but make no mistake, I take mental illness very seriously, especially because it often goes untreated. We've taken some extra steps at the end of the video with information that you, or someone close to you might need. On a lighter note, it's always a blast to do creative things like the video with my band, crew, and family. Bringing Michael St. Michaels into the fold was like having your favorite wacky uncle over for the holidays! He did a great job as our version of Nurse Ratched and he's an absolutely lovable and talented guy...go see The Greasy Strangler!" View "Choosing Mental Illness" on KNAC.COM HERE. The video includes a slate of information from Crisis Text Line. The non-profit organization provides free, 24/7, confidential crisis support. Text HOME to 741741 anywhere in the United State to be connected with a trained Crisis Counselor now. You can also learn more here at https://www.crisistextline.org/faq/. Information on the Suicide Prevention Lifeline is also included immediately following the video. The National Suicide Prevention Lifeline provides free and confidential emotional support to people in suicidal crisis or emotional distress 24 hours a day, 7 days a week, across the United States and includes options in Spanish, and for the deaf and hard of hearing. Dial 1-800-273-8255 to speak with someone now. In related news, PHILIP H. ANSELMO & THE ILLEGALS will unite with Housecore labelmates KING PARROT this fall for their long-awaited US live takeover. Set to commence September 6th in New Orleans, Louisiana, the trek includes a headlining slot at this year's edition of Berserker Fest September 28th in Pontiac, Michigan. VIP meet and greet packages are currently available via the Housecore Store. See all confirmed dates below. Select tour stops will include onsite mental health support from the Veterans Crisis Line, The Veterans Crisis Line connects Veterans in crisis and their families and friends with confidential support 24 hours a day, 7 days a week, 365 days a year. Additional information on this and other non-profits will be announced in the coming weeks. Dial 1-800-273-8255 and press 1 to speak with someone now.